Sigh. More luxury flats. Pimlico this time. More Dubai on the Thames luxury flattery. On this occasion it’s the Duke of Westminster via his property company, Grosvenor Estate. Luxury flats. How original. But why not? Everyone else is at it – it’s the most efficient way to turn a buck. This is not a class warrior thing with me. Rather, I despair at the homogenisation of London by developers, this incessant conversion of historically significant buildings and areas into luxury apartments. There have been a few small, yet pleasing wins. A pub here, another one there. The retention of West Smithfield for the Museum of London. But mostly it’s the chucking up of bland glass and steel, little of it with much architectural merit. Stinking up the place and blighting the skyline. But back to the story. Grosvenor Estate has given a group of six shopkeepers in Pimlico Road notice to quit their premises by the end of the year. The plan is to bulldoze the lot and replace them with luxury flats and, oh, some larger retail units. The owners of these shops – all successful – are none too pleased, needless to say. One of the units is a Victorian timber yard which has been in continuous business since 1840. Run today by Travis Perkins, for most of its history it was owned by the family firm WH Newson, who founded the business 175 years ago. 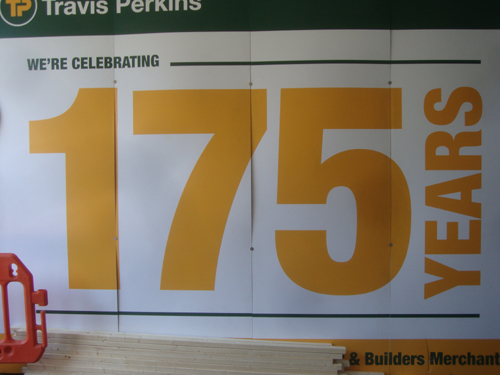 Travis Perkins has recently been celebrating this fact with its Pimlico Road employees. Back in 1840 Pimlico was very much on the up, largely thanks to that titan of suburban development Thomas Cubitt, who had a massive goods yard on the Thames nearby. The area had formerly been virtually uninhabitable owing to its marshy, mosquito-ridden landscape. But Thomas Telford’s new St Katharine’s Dock east of the Tower of London had changed all that when spoil from the development had been used to reclaim land in the Pimlico area, hence rendering it fit for development. One wonders whether Cubitt’s contractors and foremen engaged WH Newson as a supplier? Highly likely. Pimlico Road is located opposite the dual intersection with Ebury Street and Bourne Street (formerly Westbourne Street). It wasn’t called Pimlico Road in 1840 either: west of Ebury Street it was Grosvenor Road, and to the east, Queen Street. If you look it up on a map, you’ll see it sits right where Chelsea meets Belgravia meets Pimlico, in the middle of an area largely dominated by the Grosvenor and the Cadogan estates, both of which resulted hundreds of years ago from lucky young chaps marrying phenomenally wealthy heiresses. They have proved over the years largely to be enlighted and responsible landlords, something one hopes this may prevail in this particular case and that Grosvenor may yet change its mind over Pimlico Road as it did once before, in 2001. More on this story as reported in yesterday’s Evening Standard. Yes, once again Landlords/developers bulldozing our national heritage for pure greed. It’s so sad…losing Earls Court, other places for ugly, overpriced flats only millionaires can buy. Where’s London disappearing to? Those buildings and shops are irreplaceable. As someone currently trying to buy their first home in the capital, I am painfully aware of the lack of housing available. There are many reasons for this – and this blog isn’t the place to discuss them – but, right now, this is an absolutely dominant imperative that must override other concerns. London desperately needs new residential homes! This is an unremarkable Victorian terrace and if you want to see what a timber yard looks like you can go to one of Travis Perkins’ many other outlets. (It’s stacks of wood in a yard.) Of course I want buildings of great historic interest preserved but I feel many oppose any new development on principle rather than keeping their powder dry for the cases worth fighting. Thanks, Matthew. Understand the opposing new development on principle thing. I wasn’t entirely convinced, for example, on the saving the Cleveland Street workhouse thing a few years back, though I supported the campaign at the time. This article is overly focused on TP because I know a little about the background of that. But there are other independent and successful shops affected too. The new development will simply further homogenise a streetscape in London (okay, I haven’t seen the plan, but call me a whotsit if I’m wrong). And whatever goes up, be assured it won’t be for the likes of Londoner first time buyers, that’s for sure. I’m trying hard – really hard – not to be all class warrior over these cases, but landlowners, developers and councils don’t make it easy. Class worrier mabye. Yes it’s vital for the London working class to have access to proper high-end interior design consultants, antique mirrors restorers, specialist wallpaper shops, and boutique art galleries. So they should be torn down and replaced with luxury flats. That’ll help. 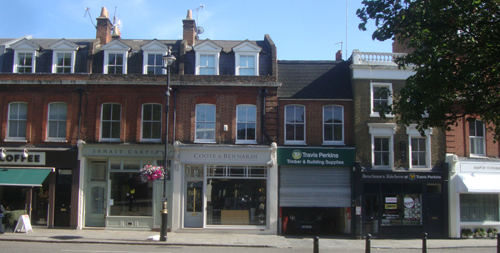 Two of the six buildings possibly destined for the bulldozer are the earliest on the Pimlico Road’s Orange square, part of the original development when John Newson built the fine houses of Bloomfield Terrace circa 1840, which run parallel to the Pimlico Road with Newson’s timber yard or Travis Perkins, as it is known today, sandwiched between them. Also part of the proposed redevelopment, currently used as an independent gallery, is the original Grade II listed cart entrance to the timber yard on Bloomfield Terrace, with its unusual timber cobbled floor, a great curiosity for historians. 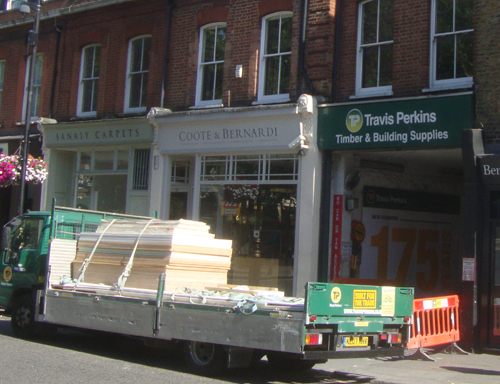 Contrary to what you say, TP is not just another timber yard. It is celebrating its 175th anniversary this year and as far as we know, the last surviving timber yard still in continued use for its intended purpose in the UK today. Therefore in my opinion, historic and worth saving as a national working treasure. See the current World Of Interiors article on the Timber Yard by Phillip Davies ‘Logging the Past’ October 2015. The Landlord/developer, the Grosvenor Estate, is proposing for the six small galleries, five of which are circa 1000 square ft. and the large Victorian timber yard to be replaced with three mega units, ten times the size and eight luxury flats above. Galleries of such a size are likely to appeal only to large multinational companies, completely at odds with the independent trading nature of the street!!!! Between them, three of the galleries have been trading here for well over one hundred years, plus some of the owners live above. They are being kicked out with a total disregard for the people living and working here, and the historic nature of the site, (oh by the way it is in a conservation area), all this to boost the coffers of the Grosvenor Estate, not content with the high rents they are already achieving in central London…………….. their last year financial gross profit was only half a billion pounds!!!!!!!!!! So Mathew, before you say getting onto the London property ladder is “absolutely dominant imperative that must override other concerns”, spare a thought for those who have already built a life here, and are at the hands of the property developer!!!!!!!! I think you are slightly missing the point here Matthew. This proposal is about developer greed, wanting to maximise rentable value above all else in an area where the existing tenants have done more than most to bring the area up, whilst the landlord (duke) has sat on his inherited assets. You might not yet have need for what they sell,(nor do I by the way) but they have all worked hard over a number of years to develop their individual business, many of them supporting a chain of crafts people and restorers. You might think it an unremarkable row of buildings, but they are an important part of the streetscape which makes up an area known for its’ independent business and which differs greatly from areas spoilt by profit led development. The new apartments if they are built will be for the mega-rich and is a knock-on effect of the barracks development at the other end of the street, All second/third/more homes for millionaires. The Grosvenor Estate (Duke of Westminster) does not need to do this. He is the richest man in the country who’s company reported half a billion in profits last year – he could significantly contribute to the housing crisis with real developments in London and elsewhere that is not going to pick on a few small retailers for the sake of a dozen posh serviced apartments. And please go take a look at the street and particularly the timber yard if you are ever in the area, you might just change your mind that all timbers yards are the same and you’ll meet a lot of working class people who will loose their jobs if the scheme gets the go-ahead. I have created an online petition via 38degrees if you are against the development and would like to stop it!! Thank you for your support, and thank you Mike. and the flats opposite will go. Landlord wanted to demolish Coleshill buildings, many years ago, but it is listed, so he leased the estate off to Peabody. the whole Pimlico Road area was working class then, you could buy anything in Pimlico Road, from Wet fish, to ironmongery, bakery, dairy and men’s tailors! An attempt to destroy Newson’s yard a few years ago was thrown out. Let us hope it happens again. As for the shops being forced out, rents are now so high, long established businesses have closed. Flamenco, a Spanish restaurant flourishing for over 25 years, was virtually closed down over night, because the increase in rent was so much, that the owner told me, if they worked 24/7 every day of the year, they could never make the amount needed. Cadogan is doing the same in Chelsea. London is being ruined. It used to be said, London was a great place to live, rich and poor living side by side. Now only rich are welcome, and the rest of us can just clear off! I’m so tired of hearing these stories of the destruction of the most interesting parts of London. I couldn’t find a petition for saving Pimlico Rd. I would support it if someone could send me details. There is a link in one of the other comments. Here it is again.